Hyleme George, Director of the IgniteX Cleantech Accelerator Program for Black & Veatch, reveals plans for its new Cleanteach Accelerator, powered by LaunchKC, on Wednesday. 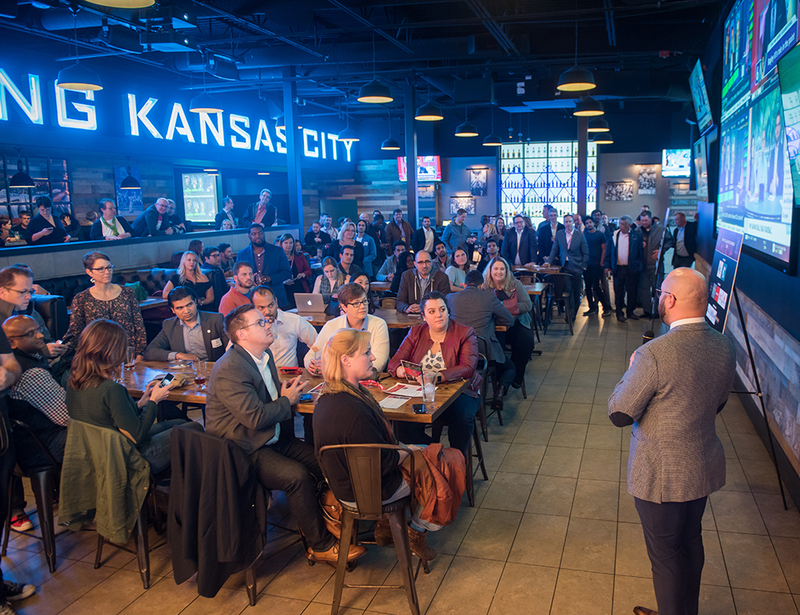 Engineering and construction company Black & Veatch cemented its place in the Kansas City startup ecosystem Wednesday by introducing its IgniteX Cleantech Accelerator, powered by LaunchKC at a kickoff announcement event at Boulevard Beer Hall. Black & Veatch, the largest engineering company in the Kansas City area, is a global leader in engineering, procurement and construction (EPC) services for energy, water and telecommunications. It’s IgniteX Cleantech Accelerator marks one of its boldest moves into the entrepreneurial arena of engineering services. The company recently created a segment of the company known as the Growth Accelerator, leveraging Black & Veatch’s core strengths to explore new and emerging markets. Black & Veatch’s IgniteX Cleantech Accelerator, powered by LaunchKC will seek partnership with startups focused on renewable and distributed energy, mobility, agricultural technology, machine learning and AI, and other technologies or processes adding value to engineering services. The program will include equity awards, a 75-day period of collaboration with Black & Veatch and program supporters, and a demo day in November. The application is scheduled to open next week, and will be located on the IgniteX Cleantech Accelerator website. “The bottom line of the new platform is to attract scalable companies to the city to create more jobs and opportunities while growing our economy,” said Drew Solomon, senior vice president, business and job development for the EDC. Businesses who choose to participate in the Black & Veatch IgniteX Cleantech Accelerator, powered by LaunchKC will gain valuable training and insight to grow their business through collaboration with a top global infrastructure provider, as well as exposure and networking opportunities with an experienced network of investors, supporters and clients in Kansas City and around the world. Solomon explained that industry-focused business accelerators provide a more complete bundle of benefits for entrepreneurs, including seed investment, connections, mentorship, and educational components. The new LaunchKC programs will feature public pitch days to showcase each cohort of entrepreneurs. The events are designed to accelerate their growth. “The accelerator platform will provide investors pathways to take equity stakes in early-stage businesses after grants have been awarded,” he said. LaunchKC, the 5-year-old grants competition for tech startups nationwide, will work in partnership with Black & Veatch to provide competition management, marketing and event services. LaunchKC is a joint venture of the Downtown Council of Kansas City and the Economic Development Corporation of Kansas City. LaunchKC is funded by the Missouri Technology Corporation, the City of Kansas City, Missouri, and local corporate and philanthropic organizations, including the Kansas City Power & Light District, JE Dunn Construction, Google Fiber, Husch Blackwell, KCP&L, the Ewing Marion Kauffman Foundation, the William T. Kemper Foundation, Lathrop Gage, Lead Bank, Missouri Department of Economic Development and Port KC. LaunchKC opens the next chapter of its evolution this week. Over the past four years, LaunchKC has awarded $2 million to attract and retain 38 tech startup businesses in Kansas City. Beginning this week, LaunchKC will grow from a 5-year-old grants-based program into a tech accelerator platform that will feature advantages and opportunities for investors, entrepreneurs and the tech ecosystem of Kansas City. “The bottom line of the new platform is to attract scalable companies to the city to create more jobs and opportunities while growing our economy,” said Drew Solomon, senior vice president, business and job development for the Economic Development Corp. (EDC) of Kansas City, Mo. LaunchKC is a joint venture of the Downtown Council of Kansas City and the EDC. Solomon explained that industry-focused business accelerators provide a more complete bundle of benefits for entrepreneurs, including seed investment, connections, mentorship and educational components. The new LaunchKC programs will feature public pitch days to showcase each cohort of entrepreneurs. The events are designed to introduce their polished business pitches, and open the door to accelerating their growth. LaunchKC is working to support three KC-based industry-focused accelerators in 2019, including a second year with Fountain City Fintech (financial technology) with nbkc bank, a health tech accelerator that is currently in the works, and a CleanTech accelerator that will be announced on Wednesday. To learn more about the LaunchKC strategy, check out today’s story in Startland. LaunchKC is expected to focus on specific business verticals in 2019 — an effort to bring companies to Kansas City that can fill industry gaps. A revamped version of the annual grants competition eventually would grow those verticals into individual accelerator programs, according to Jim Malle, business development officer at the Economic Development Corporation of Kansas City, which coordinates LaunchKC alongside the Downtown Council of Kansas City. Decisions on awarding grant funding in each vertical in 2019, including the amounts of such grants, will depend on fundraising efforts, he said. The LaunchKC program previously has culminated in a pitch contest between 20 startups, with each vying for their piece of $500,000 in non-dilutive grants, rent-free office space, and the opportunity to build their new and emerging tech businesses in Kansas City, Missouri. Programs like Fountain City Fintech — a new accelerator at nbkc bank that recently wrapped its inaugural cohort with a Demo Day last week — already have a proven track record of bringing companies to Kansas City, Malle said. Five of the six Fountain City Fintech startups plan to stay in the city after the accelerator’s completion, founders announced at Thursday’s Demo Day event. Industry verticals to be supported by LaunchKC have yet to be confirmed, Malle added, but EDCKC expects to continue financially backing Fountain City Fintech, as well as providing administrative assistance for the next cohort to further the accelerator’s growth. LaunchKC’s pivot to accelerators gives the chance for companies to spend a longer amount of time in the Kansas City community and give founders and executives more opportunities to engage with area assets, said Zach Anderson Pettet, managing director for Fountain City Fintech at nbkc. The experience with nbkc’s fintech program exceeded EDCKC’s expectations, Malle told the crowd Thursday evening at the Demo Day event. 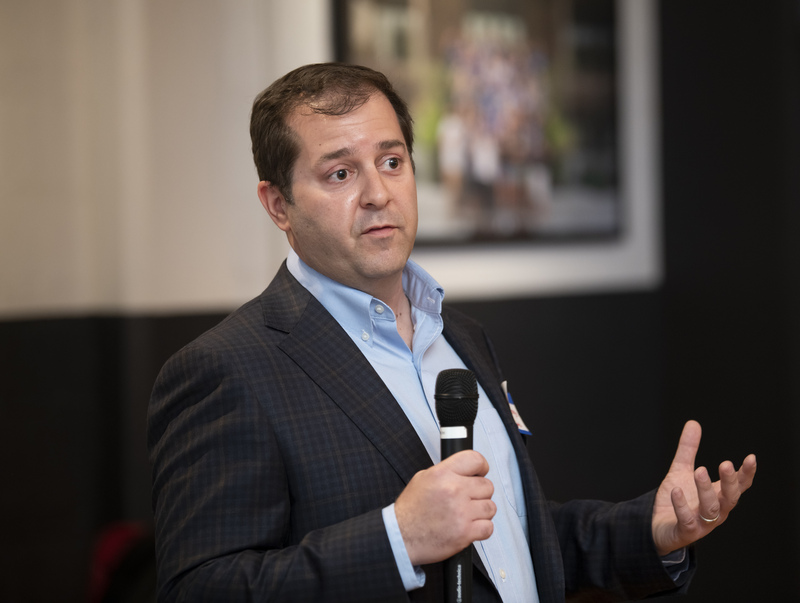 Feedback from cohort members and others associated with the accelerator will help determine programming adjustments for future iterations of Fountain City Fintech, Pettet said. The fintech’s first-year success is a direct result of the cumulative efforts of the Kansas City entrepreneurial ecosystem, Pettet added. Developing an innovation district takes a village, Kevin McGinnis told a packed room of Global Entrepreneurship Week attendees — a cross-section of Kansas Citians eager to learn more about how his proposed Keystone innovation district could re-shape diversity and inclusion efforts in the startup space. “I’m not going to suggest that I’m bringing a bunch of Overland Park executives in to mentor the black community,” said McGinnis, CEO of the Keystone Community Corporation, attempting to clarify his plans during the GEW panel on emerging innovation districts. Developers aren’t out to erase or diminish the heritage and history of the people who make their homes or businesses in the neighborhoods in and around 18th and Vine — the area the former Sprint executive and founder of the Sprint Accelerator intends to redevelop into an entrepreneurial hub, he said. Click here to read more about the planned Keystone innovation district. A series of diversity and community engagement programs are planned for the district, but have yet to be fleshed out, McGinnis added. Speaking up during a question-and-answer period at the event, Nia Richardson, director of business development at DuBois Consultants, a Kansas City civil and structural engineering firm, challenged the generalities of McGinnis’ announced plans. Ditching words like “diversity” and “inclusion” are a start, she said, encouraging the panel and attendees to directly address the reality than an innovation district would most impact the black community already living in the area proposed for redevelopment. The CEO and his partners are open to community-curated ideas and collaboration with local organizations as they navigate their role in diversifying the entrepreneurial ecosystem, he replied. All too often, diversity-led programming doesn’t know where to find a home in Kansas City, McGinnis argued. Establishing a centralized port of economic and entrepreneurial activity — like the Keystone District — could correct the course and provide a welcoming place for diverse and inclusive ideas and activities to flourish in Kansas City, he said. News of McGinnis plans for the Keystone District broke last month, shortly after his company secured its first parcel of land near 18th and Vine. To stay abreast of the KC tech scene, stay tuned to the Startland News. LaunchKC judges awarded $500,000 in grants to nine tech start-up businesses on Friday, following a months-long competition designed to attract and retain tech entrepreneurs in Kansas City. This year’s grants competition elevated LaunchKC to the $2 million mark in grants to 38 different entrepreneurs over four years. “This is a tremendous milestone as we demonstrate our commitment to attracting, growing and retaining startup businesses in Downtown Kansas City,” said Mike Hurd, spokesman for LaunchKC, an initiative of the Downtown Council and the Economic Development Corporation. The nine winners, including five from Greater Kansas City were selected Friday afternoon from a pool of 20 finalists. Each of the final 20 presented their business pitches that morning to LaunchKC judges and the Techweek Kansas City audience at Union Station. Grant winners were announced Friday afternoon at a special LaunchKC / Techweek Kansas City awards ceremony at No Other Pub in the Power & Light District. Ag Voice from Atlanta, GA, was only the second, $100,000 grand prize recipient in LaunchKC history. It is a mobile voice-interaction service designed for food and agriculture professionals to capture insights on the go. By using proprietary analytics and processing of raw voice files including captured time stamps and location data, users can improve productivity and workflow management, increase documentation accuracy, and gain valuable insights to optimize the use of resources in crop and animal production for a sustainability and environmental impact. Boddle Learning, Kansas City, Mo. Erikos Systems, Kansas City, Mo. “Each of the 20 finalists were very strong contenders for LaunchKC’s grants, as well as for building strong, economically successful businesses,” said Drew Solomon, senior vice president for business job development at the EDC and chair of the LaunchKC competition. Today’s announcement marks the culmination of weeks of application reviews and scoring by a panel of more than 35 business and financial leaders, who volunteered their time to thoughtfully narrow the field from 586 applicants – up 32 percent from 2017 – to the 20 finalists who competed on Friday. “LaunchKC attracted more than 2,000 applications from throughout the nation and the world in our four years of competition with tech entrepreneurs,” said Hurd, marketing officer for LaunchKC and the Downtown Council. “This year’s awards mean we have reached $2 million mark. “We believe in entrepreneurship and we believe these start-ups have a better chance to success in Kansas City,” Hurd said. In addition to cash grants, the nine winning applicants will receive a network of support, industry-specific mentor teams for each grant recipient; and opportunities to meet and learn from industry and entrepreneurial leaders in and around Kansas City – all designed to elevate their efforts to build high-growth, tech sector businesses and jobs in KCMO. “LaunchKC is an economic game-changer in Kansas City through its support of start-up businesses. It creates jobs, attracts talents, unlocks value, and engages follow-in investors,” Solomon said. Academy Bank; Country Club Bank; Generator Studio; Helix; Ewing Marion Kauffman Foundation; Missouri Small Business & Technology Development Center; Park University; and the UMKC Bloch School of Management. An executive from the National Aeronautical and Space Administration (NASA) will “launch” the annual LaunchKC Pitch Day with an opening keynote address on Friday, Oct. 12 at Union Station. Kira Blackwell, Program Executive, Office of the Chief Technologist, NASA will speak to the audience at 8 a.m. Friday, immediately before the start of the LaunchKC Pitch Day in the Extreme Screen Theatre at Union Station. Blackwell will share insights into NASA iTech, a year-long effort to find innovative ideas that address challenges and fill gaps in five critical areas identified by NASA as having a potential impact on future exploration, including big data and data mining; artificial intelligence and autonomous robotic capabilities; revolutionary concepts for communications; medical breakthrough; and x-factor innovations. The NASA-inspired keynote falls on the fifth and final day of the Techweek Kansas City conference. Friday is primarily focused on LaunchKC, the the final round of the fourth annual grants competition for tech startups that has been a part of the Techweek KC experience, since its first local conference in 2015. “We are delighted to welcome Kira Blackwell and NASA to ‘launch’ the Pitch Day events,” said Drew Solomon, senior vice president of business and job development for the Economic Development Corporation of Kansas City, Missouri, and competition chair for LaunchKC. The LaunchKC Pitch Day marks the final day of the annual grants competition. Beginning at 9 a.m. on Friday, the 20 LaunchKC finalists will make their business plan presentations to a panel of LaunchKC judges AND the Techweek Kansas City audience. Solomon said Blackwell has agreed to join the panel of judges. “NASA iTech and LaunchKC are cut from the same innovative cloth – both are showcases for entrepreneurs who are looking to change the trajectory of the world through their innovative thinking and business plans,” Solomon said. NASA iTech is a program within NASA’s Space Technology Mission Directorate and works in collaboration with The National Institute of Aerospace (NIA) in support of the Agency’s Mission. This collaborative effort identifies and fosters innovative solutions that aim to solve challenges on Earth and also have the potential to solve some of NASA’s challenges agency-wide. 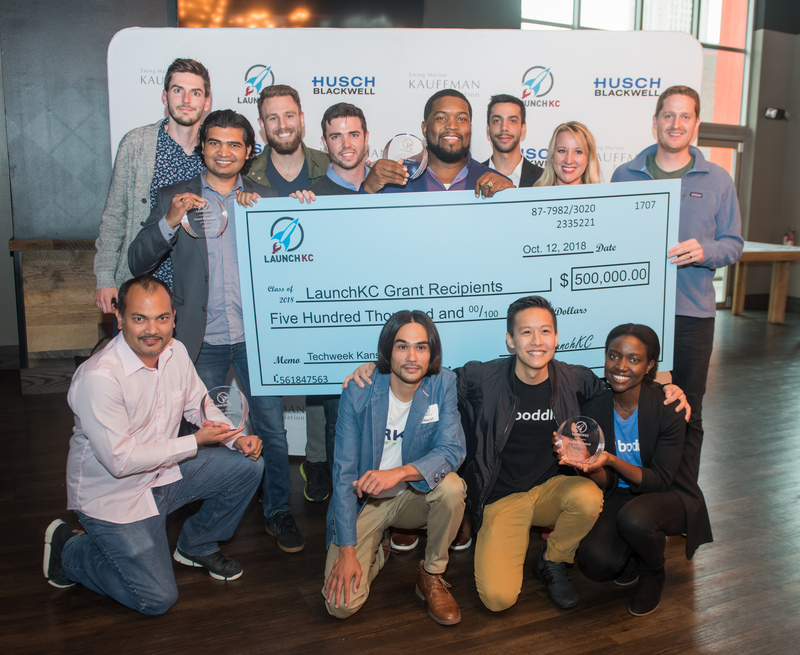 LaunchKC is a national grants competition designed to attract tech entrepreneurs to compete for non-dilutive grants and the opportunity to build their new and emerging tech businesses in Kansas City, Missouri. “LaunchKC has attracted more than 2,100 applications from throughout the nation and the world during our four years of competitions,” said Mike Hurd, marketing officer for LaunchKC and the Downtown Council. Tickets to the LaunchKC Pitch Day – including Blackwell’s keynote address – are part of the Techweek Kansas City ticket package, and are available right here. Adknowledge; American Century Investments; BalancePoint; J.E. Dunn Construction; Google Fiber; ITEN; Lathrop Gage; LightEdge Solutions; Metropolitan Community College, Parson & Associates, RubinBrown; and Spring Venture Group. For more information, contact Mike Hurd at mike@downtownkc.org or visit www.launchkc.org and www.techweek.com. The fourth annual Techweek Kansas City conference continues today, at Union Station and other KC locations will be hubs of innovation, discussion and inspiration now through Friday.. If you haven’t already made plans to attend, it’s worth rearranging your schedule. 5. Learn something new: Smart City development, blockchain, FinTech, big data, diversity and inclusion in technology—there’s no shortage of topics discussed during panels, keynotes and presentations throughout the week. See the schedule. 4. Solve a problem: Are you struggling with a work-related problem that technology could solve? Techweek KC includes the Techweek KC EXPO, a mini tradeshow floor – from 9 a.m. to 5 p.m. today (Tuesday) and Wednesday – that showcases solutions and capabilities from companies ranging from start-ups to enterprise-level. 3. Cheer on local entrepreneurs: Both BetaBlox and Techstars will host demo days during Techweek, giving early-stage entrepreneurs a chance to showcase their companies. Who knows—you might very well see The Next Big Thing in Tech right here in Kansas City! Plus, the LaunchKC grants competition will award grants to start-up businesses (Friday), and you’ll get to see it all unfold at Techweek KC. 2. Expand your network: Just think—during Techweek KC, you’ll not only be able to mix and mingle with local leaders, entrepreneurs and stakeholders, but you’ll also have a chance to talk with national innovators who are leading the way at companies like Google and NASA. Keep those business cards handy! 1. Make lasting change: One of the best things about Techweek KC is that it sets the stage not only for learning, but also for action—and you can join in. On Wednesday, for example, a day-long track will be dedicated to diversity and inclusion in tech entrepreneurship, including how to build inclusive ecosystems. The tech industry is often slowed down by too much talk and too many buzzwords. Instead, at Techweek KC, you’ll have a rare opportunity to cut through the noise and make things happen. There you have it! Five great reasons to attend Techweek this week. See you there! Candidates to be Kansas City’s next mayor will take the stage Monday at Union Station in one of Techweek KC’s first events of 2018 to talk tech and its importance in shaping the city’s future, said Ryan Weber. Techweek returns to Kansas City on Monday for its fourth, annual week-long technology and entrepreneurial conference. Events runs through Friday, which will feature the LaunchKC Pitch Day and a keynote address by NASA’s Kira Blackwell. A snapshot of the complete Techweek program is featured below. “We’re still a long way from the [April 2] primary election, but this forum will help voters be more educated about the various candidates, their experience, credentials, and vision for the future of KCMO as a whole,” said Weber, president of the KC Tech Council. The forum does not include front-runner and former Missouri Secretary of State Jason Kander, who announced Tuesday in a Facebook that he was dropping out of the race because of Post Traumatic Stress Disorder symptoms. Announced candidates appearing Monday at Techweek KC include Alissia Canady, Jermaine Reed, Phil Glynn, Quinton Lucas, Steve Miller, Scott Taylor, and Scott Wagner. With nearly 100,000 tech jobs across the metro, the tech-focused forum is a can’t-miss for curious citizens who have questions about the city’s digital evolution, Weber said. The KC Tech Council hopes each candidate has a tech-focused strategy prepared for the city, if they are elected come the June 25, 2019, general election, Weber said. Adding the mayoral forum to a full Techweek KC schedule — which was released Monday, and can be accessed using the Attendify app — is one of the dozens of ways the 2018 event is diverging from previous incarnations of Techweek KC. Weber is expecting a conversation Monday that’s both lively and informative, he said. 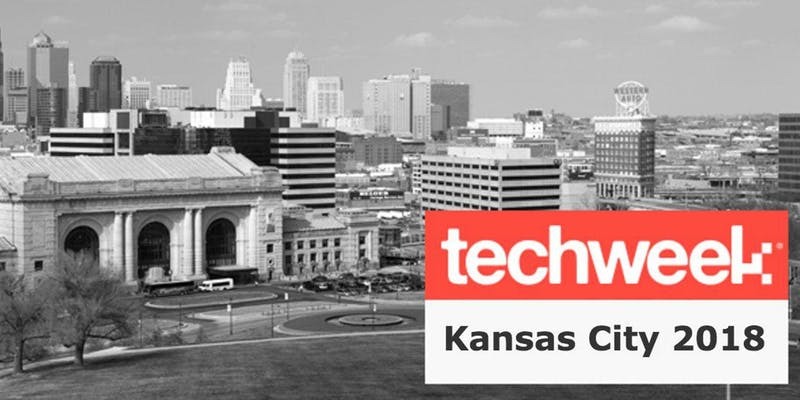 Click here for tickets to Techweek KC. Kansas City’s biggest conference series for entrepreneurs – returns next week alongside some of KC’s most premier accelerator programs and content. Demo days for Techstars KC and BetaBlox will join LaunchKC as signature events during the Oct. 8-12 conference. Techweek brings a great tech offering this year including the 2018 Techweek KC EXPO, which will host 100 booths of exciting tech companies from startups to enterprise level companies, on Monday, Tuesday and Wednesday, Oct. 8-10. For more and information and tickets to Techweek in Kansas City, visit the conference Eventbite site. The fourth annual Techweek in Kansas City conference – featuring the LaunchKC grants competition for tech entrepreneurs – is right around the corner. Techweek returns to KC on Monday, Oct. 8 and runs through Friday, Oct. 12. The fourth annual LaunchKC competition is the closing act of Techweek 2018 next Friday, as 20 finalists will pitch their business plans to a panel of judges and the Techweek audience. Union Station will serve as home base for this year’s Techweek, including conference sessions and KC EXPO on Monday through Wednesday and the LaunchKC competition on Friday. The Midland Theater will be the focus of activities next Thursday, as the focus turns to the Techstars Demo Day and programming on the Digital Crossroads. Friday will be dedicated to LaunchKC activities, including an opening keynote address now set for 8 a.m. by Kira Blackwell, Program Executive, Office of the Chief Technologist, NASA. The LaunchKC finalists will begin making their pitches to the judges at 9 a.m., and wrapping up around noon. The panel of judges will break for the next two hours to discuss the finalists, score all 20 of the presenters, and come to an agreement on the top nine entrepreneurs. The nine grant winners will be announced at approximately 3:30 p.m. that day. 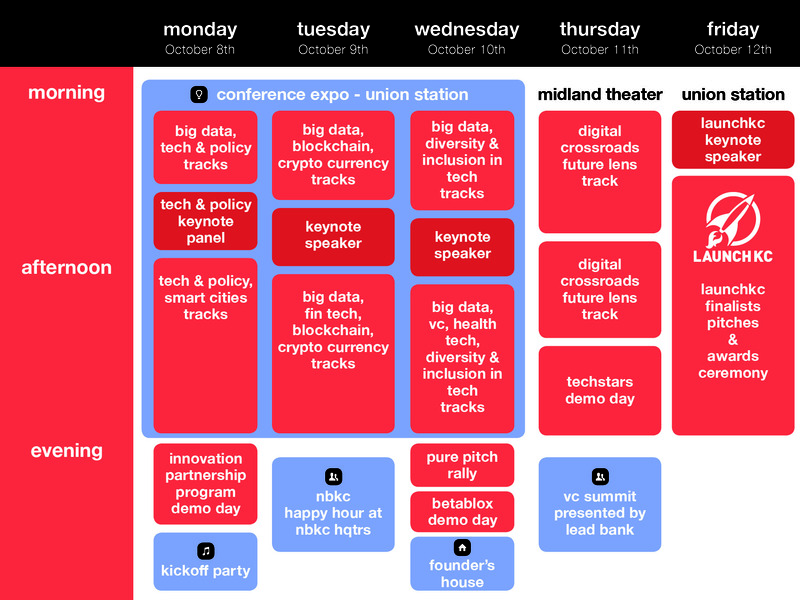 See below for a summary of the complete Techweek 2018 schedule. Tickets are available right here. To discover more about Techweek and LaunchKC, watch this space for a daily blog post every weekday through Friday, Oct. 12.